The year 2017 was a milestone year for the Federal Public Student Loan Forgiveness (PSLF) program: the first students who signed up for the federal student loan repayment option were eligible to have their loans discharged. PSLF is a loan repayment option that aims to reduce the burden of student loan debt for individuals who work in public service. The PSLF program was included in the College Cost Reduction and Access Act of 2007, a piece of federal legislation signed into law by President George W. Bush that increased the Pell Grant, created income-based loan repayment options and cut interest rates on federal student loans. The repayment option is rooted in the theory that individuals may avoid lower-paying public service jobs and instead choose more lucrative private sector opportunities to pay off their student loans. To incentivize students to choose public sector jobs (police, social work, legal aid, etc. 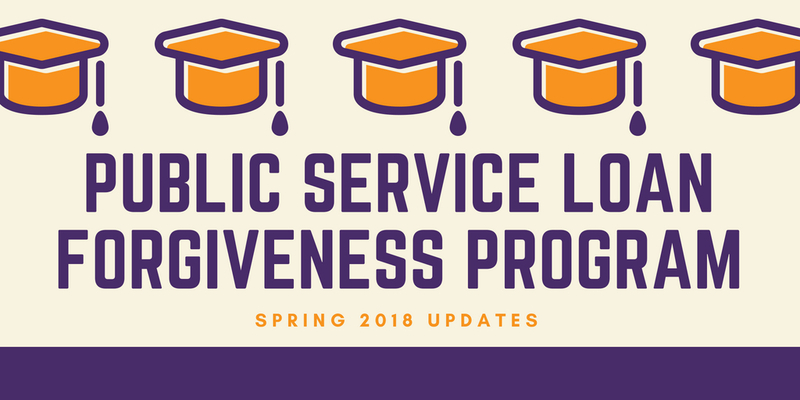 ), PSLF provides favorable terms: after 120 on-time monthly student loan payments, qualified employees are able to discharge their remaining debt. Unfortunately, of the 7,500 students who believed they had qualified to have their debt discharged as of January 2018, only 1,000 actually qualified. This is partially because, according to the U.S. Department of Education, there were a “limited availability of income-based repayment plans in the early years of the program.” It is also because of the complexity of the program. Many students have filed complaints that they were given misinformation from their loan servicers, while others faced program technicalities that disqualified some of their payments. To address this, U.S. Senator Elizabeth Warren (D-MA) introduced an amendment that was included in the FY18 federal spending bill that would expand the PSLF program to those who qualify for loan repayment but were somehow placed in the wrong federal repayment program. To see if you qualify for payment from the $350 million fund, individuals must apply for consideration through the U.S. Department of Education. To learn more, visit the U.S. Department of Education’s website and call the College Now Resource Center to schedule an appointment for a one-on-one consultation. There are staff on-hand to help you navigate this process. Want to learn more about qualifying for Public Student Loan Forgiveness? This blog post is also published on the Higher Education Compact of Greater Cleveland’s blog.